Spring is in the air. The grass is getting greener, the birds are starting to sing, and spring showers are beginning to happen more days than not. With rain comes puddle jumping!!! I cannot be the only one who absolutely loved jumping in puddles as a child right? Who am I kidding? It’s pretty fun now. One of my fondest memories after a good rain was running outside barefoot and jumping in as many puddles as I could and then coming inside soaking wet. 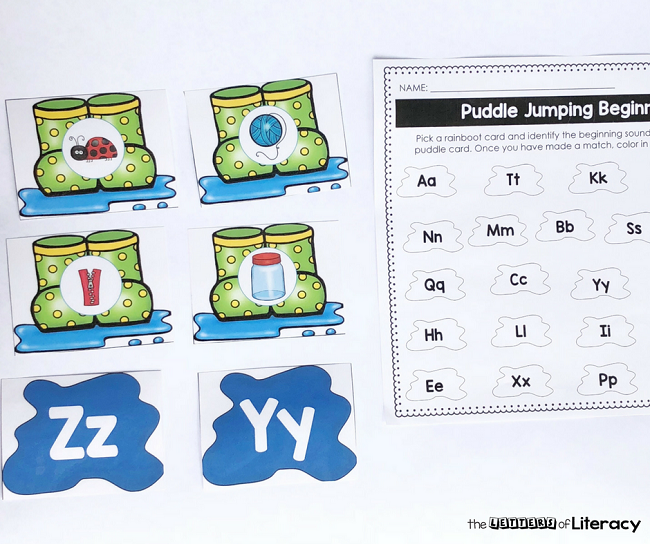 Sometimes it’s not possible to head outside and have fun running through the rain, so why not bring the puddles inside with this fun, engaging beginning sounds match? 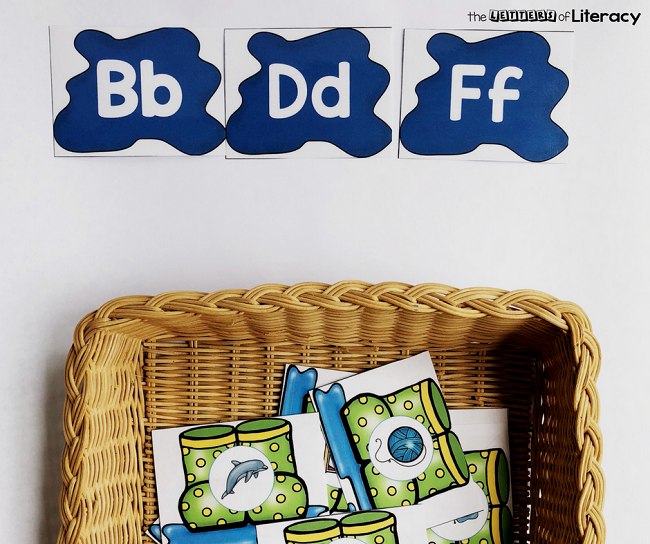 Understanding and practicing the beginning sounds in words is one of the many ways to begin building that foundation for learning to read, so why not make it meaningful and fun? 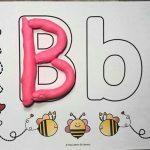 This beginning sounds matching activity is perfect for preschool, kindergarten, and first graders to work on isolating beginning sounds in words. This center comes with three different options for you to choose from, as well as coordinating recording sheets. 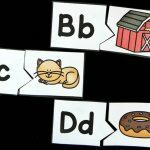 Students can choose to match the beginning sound picture with one of the three included sets of letter cards. 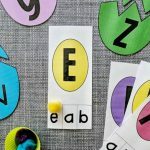 To prep, simply print, laminate, and cut out the letter and picture cards. 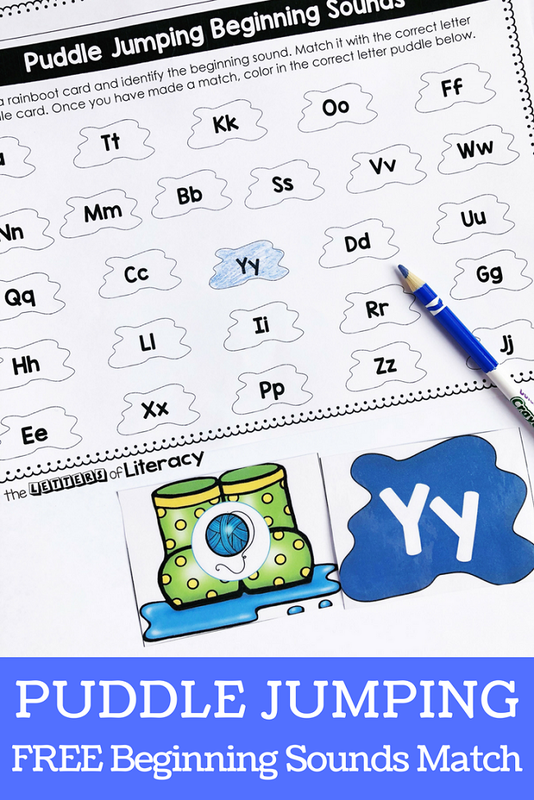 If you would like to use a recording sheet, you can print these out and give one to each child or slide them in dry erase pockets and give them a dry erase marker to complete. This will cut down on copies and make the recording sheet reusable. 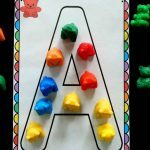 I like to place all of one set of cards in a basket and then lay out the other cards so the children can see the letters. 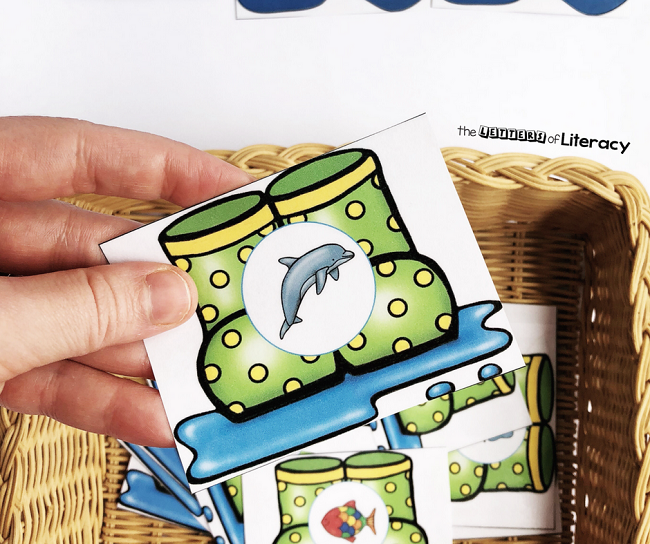 Students will pick a picture card, say the word, and identify the beginning sound. Then they will look for the letter card that matches that sound and make the match. 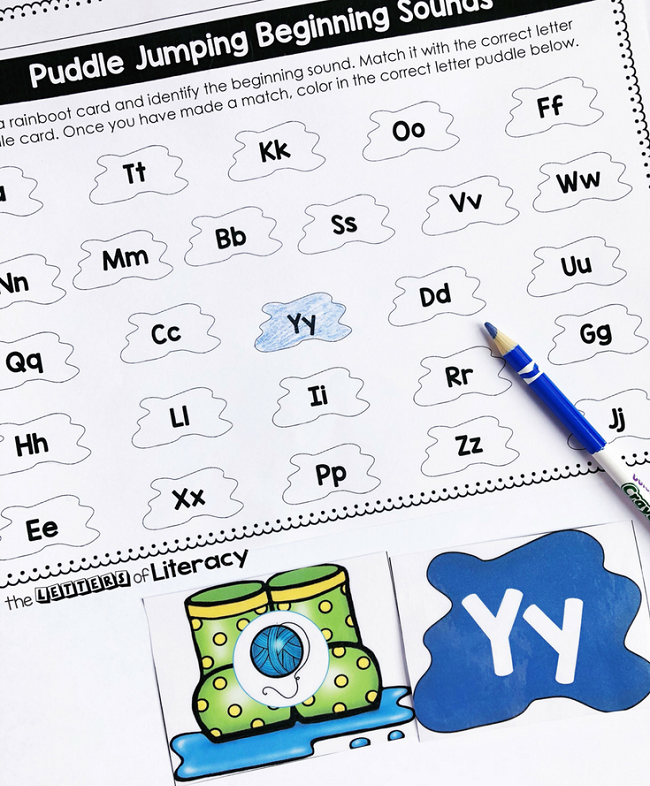 When they find a match, they can use the recording sheet to color in the correct letter puddle. 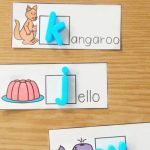 If providing 26 letter and picture cards is too overwhelming for your group, choose only a few at a time and then continue matching them up until all cards have been matched. I love giving children the opportunity to check their own work, and when given the opportunity and the environment for success, even young preschoolers can successfully check their own work. 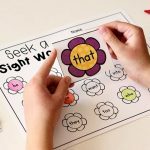 Before laminating this center activity, you can put coordinating marks or letters on the back of the matching sets. Once your group has completed the matches, they can simply flip over their matches and see if the marks or letters match up. 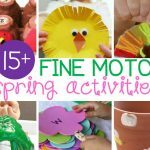 You can extend this activity in many ways depending on your goals and your group size. 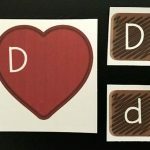 Print the cards on cardstock so they are not see through and create a memory matching game for your group to play. Flip all the cards over and take turns turning over two cards at a time and see if they match. 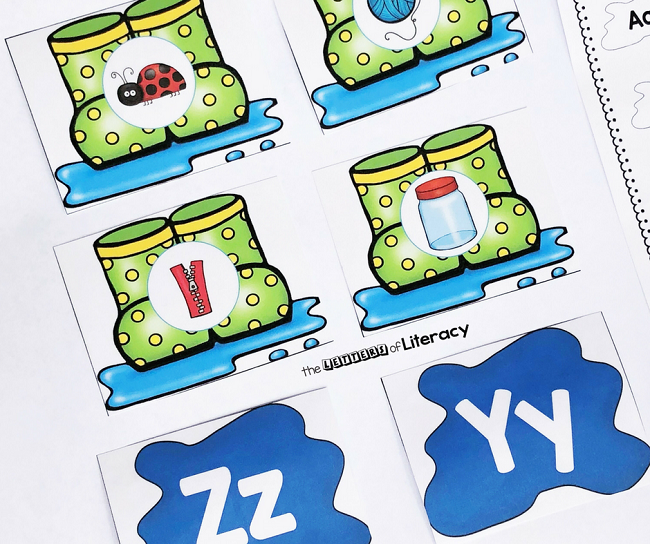 For some fun, engaging gross motor play, place all the puddle letter cards around the room and have children jump from letter to letter identifying the sound the letters make and then identifying a word that begins with the letter sound. Ready for some puddle jumping good fun? Grab your copy of the beginning sounds match cards and recording sheet by clicking on the blue button below. 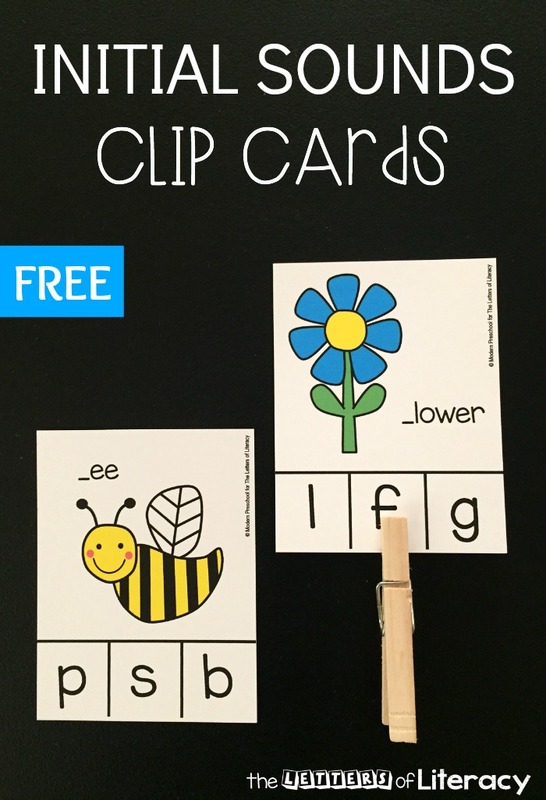 Then, for more beginning sound fun, hop over and grab our beginning sounds clip cards! Thank you for the Clip cards! It’s our pleasure! We are happy to find you enjoying our resources. Have a great rest of the school year! Adorable! I greatly appreciate the various options that you included in the freebie! Thank you!!!! What a great resource! Thank you!